Good mental health enables people to realize their full potential, cope with the normal stresses of life, work productively, and contribute to their communities. However the growing burden of mental illness is staggering. At a global level, one-in-four people will likely experience a mental health problem at some point in their lives. Meanwhile, over 300 million people are estimated to suffer from depression, equivalent to 4.4% of the world’s population, and 800,000 people take their own lives each year. The number of people living with depression increased by more than 18% between 2005 and 2015. 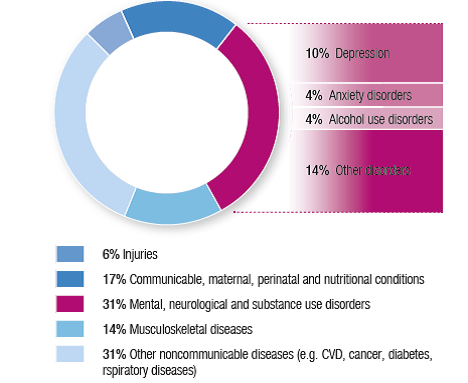 Taken together, mental, neurological and substance use disorders exact a high toll, accounting for 13% of the total global burden of disease (as measured in DALYs, or disability-adjusted life-years). More than 80% of this disease burden is among people living in low- and middle-income countries. The economic consequences of poor mental health are equally significant. A World Economic Forum/Harvard School of Public Health study estimated that the cumulative global impact of mental disorders in terms of lost economic output will amount to $16.3 trillion between 2011 and 2030. In India, mental illness is estimated to cost $1.03 trillion (22% of economic output) between 2012-2030. For the same period, China is estimated to lose $4.5 trillion to mental illness. These estimates illustrate the urgency that is needed to tackle mental illness. Untreated mental disorders (in employees or their family members) result in diminished productivity at work, reduced rates of labour participation, foregone tax based income, increase in workplace accidents, higher turnover of staff and increased welfare payments. Six in 10 people say poor mental health impacts their concentration at work and estimates indicate that nearly 70 million work days are lost each year in the UK because of poor mental health. It is also increasingly evident the negative role that stigma plays by decreasing the chances of people seeking proper diagnosis and treatment. For example, according to a 2008 survey in Canada, just 50% of Canadians would tell friends or co-workers that they have a family member with a mental illness, compared to 72% who would discuss a diagnosis of cancer and 68% who would talk about a family member having diabetes. The good news is that evidence is showing that treating anxiety, depression and other mental health conditions is an affordable and cost effective way to promote wellbeing and prosperity. Just $1 of investment in treatment for depression and anxiety leads to a return of $4 in better health and ability to work. This is good for individuals, families, communities, economies and societies at large. Employers can become agents of change. The risk factors for stress in the workplace can be modified, and an organizational climate that promotes wellbeing and creativity can be developed by targeting workplace policies as well as the needs of individual employees. Similarly, effective treatments exist for common mental disorders, and an employer can facilitate access to care to those who may need it. 1. Be aware of the workplace environment and how it can be adapted to promote better mental health for you, your colleagues and the organization. Every work place is unique. It's important that before starting you source the necessary information about where you work, to determine what policies will be best suited to your company. 2. Learn from the motivations of organizational leaders and employees who have taken action. There is typically no single motivation but, rather, several motivations working in combination, including: protecting the mental health and wellbeing of employees; doing the "right thing" for the employees; benefits in employee engagement and reputation and managing costs and liabilities. 3. Don’t reinvent the wheel. Be aware of other companies who have taken action, and how. Around the world companies and organizations are already putting mental health policies into place. The toolkit includes case studies from Bank of England, Bell Canada, BHP Billiton, British Telecom Group, Kind & Wood & Mallesons, among others. 4. Understand the opportunities and needs of you and your colleagues, in helping to develop better policies for workplace mental health. Every organization is different, and will require a unique set of policies to best deal with the needs of its staff. It’s therefore important to identify what these needs are, and how a workplace mental health programme could begin to address these. 5. Take practical steps to help your organization. Workplace strategies to protect, promote, and address mental health are commonly delivered by building internal and external partnerships. The successful delivery of any mental health initiative relies on collaboration. Employees can seek educational materials, leverage local training programmes, either use or promote with human resources the use of the adequate diagnostic tools and move forward with the development, implementation and evaluation of workplace wellbeing strategies. 6. Find out where to go if you or a colleague needs help. Getting help for a mental health problem can be a personal and emotional challenge for some people. The important thing is not to be afraid of asking for support, or of being there for colleagues that may need support. As Dr Brock Chisholm, the first Director-General of the World Health Organization and a psychiatrist that shepherded the notion that mental and physical health were intimately linked, famously said: “without mental health there can be no true physical health”.